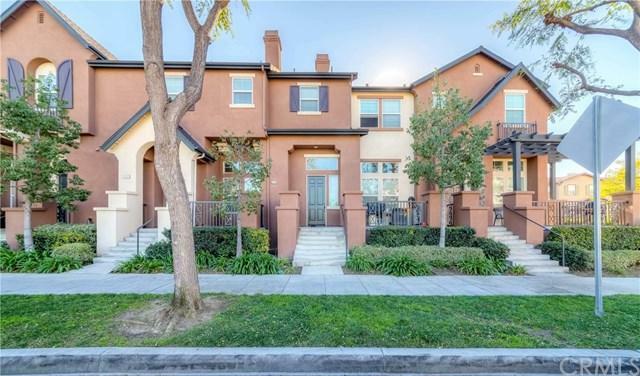 BEST INVESTMENT & START UP HOUSE IN NEWER DEVELOPMENT IN ORANGE COUNTY, CITY OF FULLERTON! THE PRESTIGIOUS AMERIGE HEIGHTS +G+RADCLIFFE+G- COMMUNITY, WELL KNOWN MBK BUILDER HOME, SITUATED VERY CLOSE TO THE AWARD WINNING SCHOOLS INSIDE OF COMMUNITY, FISLER ELEMENTARY (K-8) AND SUNNY HILLS HIGH SCHOOL. BEAUTIFUL MORDEN LAYOUT WITH SPACIOUS 2 MASTER SUITES + 2.5 BATHROOMS + LOFT (DEN) WITH BRIGHT & AIRY FLOOR PLAN, 1623 SF OF LIVING SPACE, HIGH CATHEDRAL-VAULTED CEILING, FROMAL LIVING ROOM WITH COZY FIREPLACE, DINING AREA WITH CONVENIENT FAMILY ROOM AND KITCHEN, UPGRADED GRANITE COUNTER TOPS, LAMINATED FLOORING THROUGH OUT, CONVENIENCE LAUNDRY ROOM UPSTIARS, DIRECT ACCESS TO GREAT SIZE OF 2 CAR ATTACHED GARAGE WITH GOOD SIZE OF STORAGE IS BONUS! JUST A FEW STEPS, HIGH RATED MONTESSORI, EDUCATION CENTER, PARKS, GYMS, TARGET, ALBERTSON, ROSS, SHOPPING CENTERS, BOOK STORE, RESTAURANTS, GOLF SHOP AND GOLF CLUBS! COMMUNITY AMMENTIES INCLUDE SWIMMING POOL, TENNIS COURTS, AND PARKS WITH PLAYGROUND! EASY TO GO TO METRO STATION, CAL-STATE COLLEGE, KOREA TOWN IN BUENA PARK, 4D MOVIE THEATHER, K-POPS, SHOPPING CENTER, BREA MALL, SANTA ANA ZOO, SCIENCE CENTER, MUSIEUM AND MUCH MORE!! THIS HOME IS PERFECT FOR YOUR ENJOYABLE LIFE! Sold by Lena Byun of New Star Realty & Investment.